Watching the discussion about difficulty modes and accessibility in games unfold over the past couple of weeks, it has been frustratingly apparent that there are actually two entirely different conversations taking place in parallel -- with the participants largely shouting uncomprehendingly past one another. The debate was kicked off by the launch of Sekiro: Shadows Die Twice, one of From Software's most uncompromisingly challenging and difficult games yet. While the tenor has been raised by insightful contributions from the likes of God of War director Cory Barlog, much of what passes for discourse on this question is still a lot more like the meme-worthy and utterly lacking in self-awareness "you cheated not only the game..." tweet than it is to the thoughtful ideas of actual game creators. At the heart of what's become a completely unnecessarily contentious issue is a core distinction that many people are failing to make; the difference between "accessibility" and "difficulty." Those most upset at the suggestion that Sekiro's difficulty excludes people unfairly are conflating those two ideas; they dismiss the entire argument as being about unskilled players demanding an "easy mode." 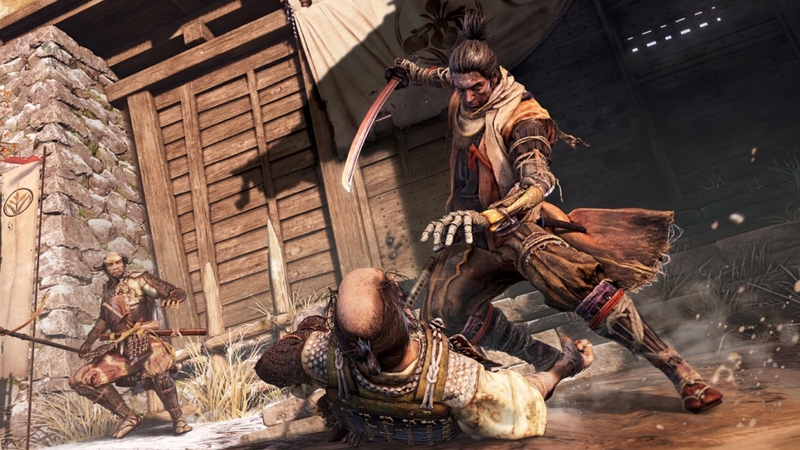 Many treatises have been written and god knows how many hours of YouTube videos recorded to mock the idea of an easy mode in a From Software game -- an outright invasion of disingenuous and ill-informed straw man arguments, petulantly "taking down" some imaginary legion of Bad Gamers who are trying to ruin Sekiro. "The dumbing down of discussions of accessibility into the notion of an 'easy mode' is ignorant and unpleasant"
I'll put my hand up at this moment and declare myself a Bad Gamer, at least in the context of this discussion. I haven't bought Sekiro, and I won't; I bought one of From Software's excruciatingly unforgiving games quite a few years ago (Dark Souls, I think) and for me, personally, it was a waste of money. I don't have the time to plug into getting good enough at a game like this. I loved the setting and concepts, enjoyed hearing friends discussing the game or reading about it, but I quickly realised I'm not the target audience. My gaming time generally consists of a couple of hours snatched away in the late evening after work. I enjoy games that let me explore and unwind, not games that are going to frustrate the heck out of me after a day which probably had enough frustrations already. I totally understand people who wax lyrical about how much they enjoy the release and sense of accomplishment of overcoming something in a game through finally getting good enough after many frustrating attempts. I just have to accept that I'm no longer at a point in my life where I have the time or energy required to "git gud" at a video game. Hence, I'll probably never buy a From Software game again -- and that's fine! I'm not their audience, and I'm not arrogant enough to think I have to be included in the audience for everything. There are already more games released each year than I'll ever have time to play, without insisting that every other game also has to cater to my tastes. Here's the thing, though; I just don't have time, attention or desire enough to "git gud." There are countless other people out there who do have that time, attention and desire, but find games like these held away from their grasp not by the lack of an "easy mode", but by the lack of options that would make them accessible to the differently abled. The dumbing down of discussions of accessibility into the notion of an "easy mode" is ignorant and unpleasant, revealing an uncaring and elitist streak a mile wide in many gamers. Accessibility isn't necessarily even about difficulty at all -- though in some cases it's tangentially related. It can mean things as simple as giving people with various forms of colour-blindness options to ensure they can distinguish items in the game, making sure everything is properly subtitled and adding an option for visual cues in place of audio cues for the hard of hearing, or letting people adjust the size of text and HUD elements for the visually impaired. It can mean adding support for accessible controllers for people who can't use standard equipment, and yes, it can also mean letting players adjust things like animation speed or other specific aspects of "difficulty" to allow for conditions that impact reaction times or hand-eye coordination, or require the use of a larger and slower control device. Giving differently abled people access to games through those kinds of options and technologies isn't just a discussion about Sekiro, it's something that the entire industry should aspire to and work towards. Sekiro just happens to be a somewhat egregious example of inaccessibility (and for sure, there's also a little bit of complaining from people who don't understand that not every game has to cater to them, but it's entirely separate from the discourse about accessibility). Every game should strive to meet a useful definition of fairness, giving gamers an equal chance to play and enjoy the game regardless of their disability or condition. "Every game should strive to give gamers an equal chance to play and enjoy the game regardless of their disability or condition"
In this context, we have to look to the old philosophical argument over "fairness"; game creators need to work with disability communities and advocates to ensure they're building products that deliver equality of outcome, not just equality of opportunity. The simple metaphor often used to describe the difference between these concepts is that of three people trying to watch a football game over a short fence. Two of them are tall, able-bodied adults and can easily see over the fence; the third is a child, or in a wheelchair, and cannot see over the fence. Equality of opportunity means they're all standing on level ground, and none is granted a special advantage -- but this means that one spectator can't see the game. Equality of outcome means giving a box or ramp to the third person, so that they're raised up and can enjoy the experience the same as the other two. The challenge, then, is how to create a set of accessibility options that allow a differently abled gamer to enjoy an experience with the same level of challenge -- adjusted to their own unique circumstances -- as a fully able-bodied gamer. That's a completely different discussion to the rather self-satisfied one many gamers and commentators seem to be having with themselves this week. The question of "easy modes" is just a boringly conventional clash between commercial and creative imperatives, in which the only actual logical conclusion is that it's entirely From Software's creative freedom to build a game as tough as Sekiro, and entirely my (and every other consumer's) personal freedom to decide whether to play that game or not. Besides, if we're being realistic about the "easy mode" discussion, there already is an easy mode for every game now, in the form of game streamers. I won't buy or play Sekiro, but I've watched one of my friends in another country play a bunch of it this week. I've seen how much of the story and world-building unfolds. I wouldn't do this for a game I planned on playing myself, but for a game I'll never play, it's effectively the easiest mode imaginable -- which honestly renders the whole discussion about content being "locked away" behind difficulty somewhat meaningless. You can see any boss, any story beat, and any secret of the game you want to see on someone else's playthrough video; what's being locked away? That's the option that modern technology has created for players like me without the time or inclination for "git gud" games. Now, there should also be options for those differently abled people who do have the time and inclination to "gid gud," but find themselves locked out of games by a lack of care and attention to their needs on the part of the developer. Differently abled gamers can be just as "core" as anyone else -- they should be able to share in the pain of those endless YOU ARE DEAD screens just the same as any other player. Those most upset at the suggestion that Sekiro's difficulty excludes people unfairly are conflating those two ideas; they dismiss the entire argument as being about unskilled players demanding an "easy mode." IGN Now: Should Sekiro add an easy mode? I am sorry, i don't agree on this one man. It's like complaining 'bout Heavy Metal music for being too loud or to "heavy" and demanding a soft ballad out of the same song, because it NEEDS to be for everyone. No, there is something for everyone and it's ok. Why would we need to force everything to be suitable for every single souls in the planet?? Just skip the game and that's it, you won't "die" cause you didn't play a game a friend enjoy to play like it is. And great pt about the language being translated to English to make it easier for English speaking people. Great arguments against the brain dead "git gud" crowd. The question as always is where is the line. And it applies to both sides. You can also ask at what point do you draw the line for making a game accessible? I mean if you're blind then you basically can't play this game can you? So obviously some people can't play Sekiro no matter what they do unless they make a a version super heavy on audio and vibration cues for the sight disabled. And so to me I'm fine with a developer making a game with a reputation of being very difficult and sticking to that. As you said there's lot of games to play. As you said these games aren't for everyone even if not disabled in any way. Plenty of games are very accessible and accessibility is a selling pt. But difficulty is also a selling pt. There's just a selling pt to a game being brutal without any ways around that.